After a few years of working, it is common to want to purchase a home to live in. House prices have indeed shot through the roof! Many have to rely on home loans. However, the government has also given plenty of benefits for property. One of this is tax deductions from house property income. In this article, we will discuss Section 24 of the Income Tax Act that allows such deductions. a. Standard Deduction – Standard Deduction is 30% of the Net Annual Value calculated above. This 30% deduction is allowed even when your actual expenditure on the property is higher or lower. Therefore this deduction is irrespective of the actual expenditure you may have incurred on insurance, repairs, electricity, water supply etc. For a self occupied house property, since the Annual Value is Nil, the standard deduction is also zero on such a property. b.Deduction of Interest on Home Loan for the property –Homeowners can claim a deduction of up to Rs.2 lakhs (Rs. 1,50,000 if you are filing returns for FY 2013-14) on their home loan interest if the owner or his family reside in the house property. The same treatment applies when the house is vacant. If you have rented out the property, the entire interest on the home loan is allowed as a deduction. Is allowed when you have taken a loan for purchase or construction of a house property (not allowed in case of the loan for repairs or reconstruction). 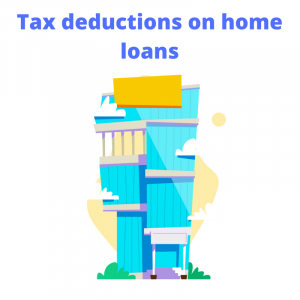 The deduction for this interest is allowed in 5 equal installments starting from the year in which the house is purchased or the construction is completed. For example, if construction of your property completed in FY 2016-17, on 25th June 2016, you can claim 1/5th of interest paid up till 31st March 2016 when you file your return for FY 2016-17. Though pre construction interest is allowed to be deducted on the basis of 1/5th each year beginning the year in which the construction is completed – the total amount of pre construction interest and interest on housing loan that can be claimed in a year should not exceed Rs 2 lakhs in any case. b. Loan is borrowed on or after 1st April 1999 for repairs, renovation or reconstruction of house property. Remember, maximum loss set off allowed in a financial year is limited up to Rs 2 lakhs, remaining loss can be carried forward to future years; 8 years in total. However, in these 8 years, it can only be set off from Incoem from house property.